For bike storage for employees and visitors, we offer several cost effective models. 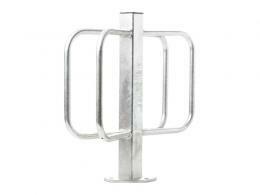 These bike racks are great for tight budgets, but still offer security from theft. In the United Kingdom, bikes are stolen on average of 1 per minute. Often, the item is never recovered or the thieves are not found. 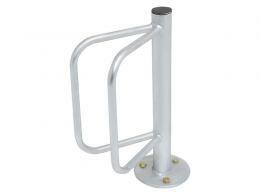 Having a secure place for the bicycles will ensure less hassle and deter stealing. 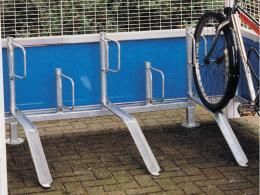 For an economical and highly secure device, purchase the Sheffield Security Bike Rail. 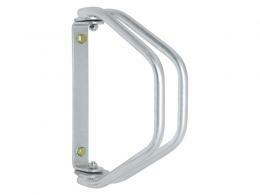 The product is constructed from durable tubular steel and is 48mm in diameter. A bike can be placed on both sides. There are 2 models available for placement, flanged or grout-in. The flanged models require M10 bolts and are sold separately. Another option is the Ground Fixing Cycle Holder. 2 designs are available that hold 1 or 2 bicycles. The unit is post mounted for surface mounting. The entire holder is weatherproof and galvanised. Requires M 10 fixing bolts that are sold separately. A 4 Cycle Wall Rack is outstanding for employee parking or schools. The unit can accommodate any type of bike wheel. The frame is tubular and constructed from galvanised steel for long term use. 2 design models are available, 45 and 90 degrees. The 45 degree angle is efficient in small spaces. An Adjustable Wall Cycle Rack offers an easy solution at a budget price. Construction of the product is galvanised steel. The product can be adjusted from 0 to 180 degrees. An added feature is the rack can hold any size tyre. For additional savings, you can purchase a pack of 3. 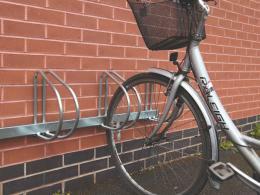 If you need more or less room, the Multi Cycle Rack can be designed to fit your needs. The unit is priced per cycle holder and you will need to specify the number. The ramps give maximum storage density. The model can be single or double sided. 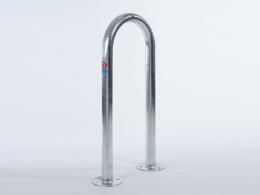 The variety of bike racks can meet any budget or style. For tight spaces, we offer racks that can be affixed to walls or smaller ground postings. If you need a specific amount of slots, we can custom build your rack. Visitors and employees can rest assured their bike is safe and not stress over this. This will in a more productive work day or build a bigger customer base.